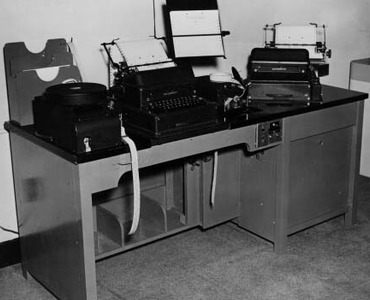 The IBM Radiotype consisted of an IBM electric typewriter equipped with an attached compact transmitter that was synchronized with a similar installation hundreds or thousands of miles away. When the transmitting machine was operated, impulses were sent to the receiving installation, either by radio or wire, so that all of the sender's keystrokes -- including backspacing, tabulating and shifting -- were reproduced on the remote machine. A typical IBM Radiotype installationBy using the Radiotype, everything that one pair of hands could do on a standard typewriter keyboard in one location could be reproduced simultaneously in any number of other locations by means of microwaves or wire transmission lines. In this way, reports, requisitions, orders, messages and all types of business documents could be distributed instantly wherever the originator desired. 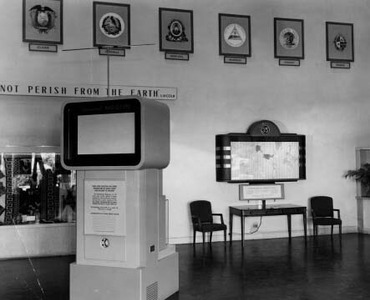 The IBM Radiotype installation shown above is receiving from miles away ultra short-wave news bulletins transmitted at 100 words per minute from IBM World Headquarters.